By the end of 15th century Spain had claimed for itself all of South and Central America and as far north in North American as California, Utah, Wyoming, Colorado and Kansas. But claiming these lands and controlling them were two totally a different matters. The professional Spanish Conquistadors sole mission was to look for gold and silver, not to create settlements for Spain. This was very true with their North America claims. In fact Colorado, Utah, Wyoming and Kansas went completely unsettled by the Spanish. The Spanish also had problems in populating the extreme northern parts of Florida and Mexico. Although British colonists from Georgia and the Carolina colonies had begun settling in northern Florida and its panhandle it was losing their state of Texas that worried Spain the most. In 1689, near Matagorda Bay in Texas, they found the remains of French explorer La Salle’s Fort Saint Louis. Fearing French encroachment Spain needed some way to secure the northern lands of Mexico, and the best way was to establish settlements of their own. They chose a method that had been successful in other regions of Mexico and California, Catholic Church Missions. The Mission system was created by the Franciscan order of the Catholic Church to spread Christianity among the native peoples. But it also provided permeant settlements that could attract other Spanish colonist to move near these missions. Of all the missions constructed in east Texas during this period the largest concentration in North America were the five built along the San Antonio River. The first of these missions was San Antonio de Valero in 1718, followed by the missions San Jose, San Juan, Concepcion, and Espada. Each of these missions is roughly five miles apart, the distance a monk could walk in a day. Today four of these five mission churches are still being used as active Catholic parishes. Only the first, San Antonio de Valero is not, but is by far the most famous. In 1718, the San Antonio de Valero mission was founded near todays San Pedro Springs Park in San Antonio. San Pedro Springs would be only the first of three sites for this mission. In 1724 it moved to its present location on the east side of the San Antonio River at an oxbow bend in that river. In 1727 a two story stone convento, or priest’s residence, was completed, and in 1744 construction began on the mission’s first stone church. A small temporary adobe building was used for mass during its construction. This first church, with its bell tower and sacristy, collapsed in the 1750’s due to poor workmanship. Construction on the second, more ambitious, church began in 1758. Its limestone walls were four feet thick to support a barrel-vaulted roof, dome and choir loft. Its design included twin bell towers and an elaborate carved façade. During this construction the Indian population declined causing work to stop. This building would remain roofless and never finished, except for the carvings on the façade. During this time the mission’s need for defense drastically changed due to a massacre of the missionaries and mission Indians at Santa Cruz de San Saba in 1758. Although Spanish soldiers had begun a defensive presidio (fort) across the river in San Antonio de Bexar it was never completed. Fearing for their safety the priests and mission Indians took it about themselves to fortify the mission by enclosing the complex with an eight foot high, two foot thick wall and a fortified gate. Added to its defenses were a small number of cannon provided by the Spanish military. For the next four decades the mission San Antonio de Valero would house and support a small number of monks and declining Indian populations, while across the river the town of Bexar continued to grow. By the late 1700’s the population of mission Indians had continued to decline throughout Texas, and also the hope that these missions would attract more Spanish settlers to northern Mexico hadn’t happen ether. In 1793 Spain began to secularize, close down, the missions in Texas. After secularization the San Antonio de Valero mission’s grounds and buildings were given to the twelve remaining Indians still living within its walls, and the mission’s religious duties passed to Bexar’s San Fernando church across the river. Over the next decade those twelve Indians would also move, leaving the mission compound to crumb in disrepair. As the 19th century dawned Mexican Texas’ borders were again challenged by France. There was a disagreement over were the border actually was. Spain claimed it to be at the Red River, while France claimed it to be the Sabine River, 45 miles further west. The threat to their northern frontier became even more of a concern for Spain when the United States’ purchased Louisiana in 1803. There were already illegal French and American immigrants in Spanish Texas, and now the always expanding United States was at their very doorstep. To help guard against further illegals from settling in Texas Spain increased their military presence throughout the region. They reinforced the small company of soldiers at San Antonio de Bexar with a Calvary company of one hundred men. These were the Second Flying Company of San Carlos De Alamo De Parras, named after the small town of San Jose y Santiago del Alamo, near Parras in the Mexican state of Coahuila. Since a proper presidio hadn’t been built in Bexar the soldiers took up residency in the already walled Valero mission. Over time the mission Valero began to be called for the Calvary stationed there, and by 1807 military documents simply referred to the place as, the Alamo. The Alamo Church late 1800’s, after the “hump” and roof was added. There is a legend that says that the mission’s name came from the rows of Cottonwood (Alamo is Spanish for Cottonwood) trees near it on the Alameda road. 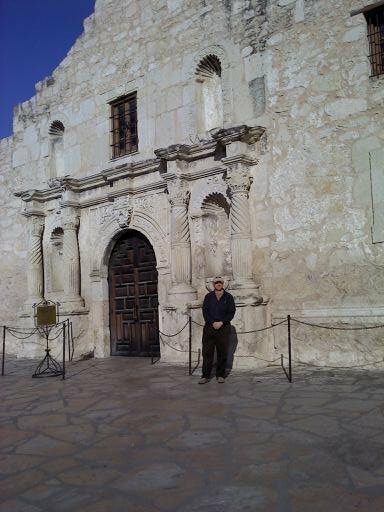 However these trees were planted long after the mission was called the Alamo. After the American Revolution the new nation quickly began its move into the western territories. The region that would become the states of Indiana, Illinois and Michigan were known as the Northwest Territory. In the south with the signing of the Treaty of Lorenzo with Spain in 1795, gave what would be the state of Alabama to the United States. This was called the Mississippi Territory. 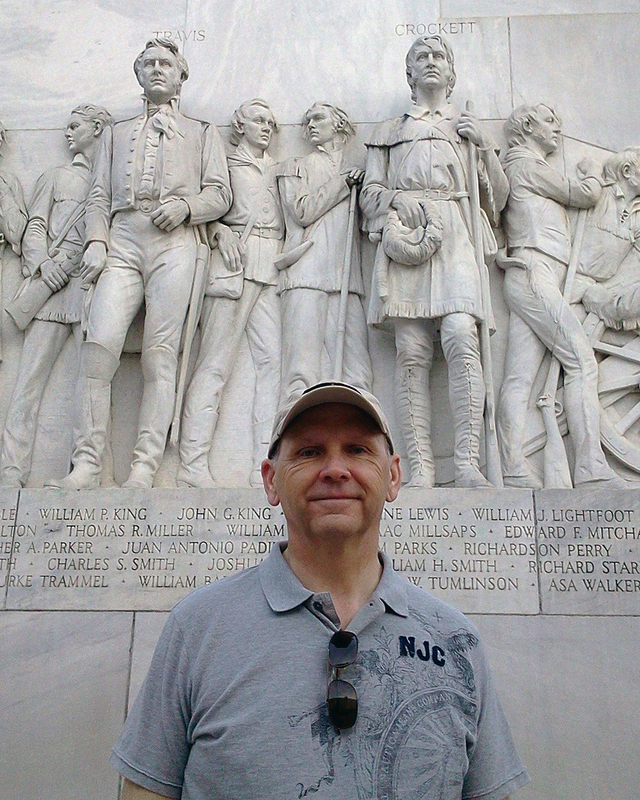 And at the center of it all, Kentucky in 1792, Tennessee in 1796 and Ohio in 1803, were added to the union as States. But the new nation was still limited in its growth by Britain in the north having Canada and Spain to the south, with Florida and all the lands west of the Mississippi River. Most troubling was Spain’s control of travel on the Mississippi river with them owning the port of New Orleans. In 1798, Spain revoked the treaty that they made with the U.S. in 1795, and prohibited Americans from using New Orleans. This also drew concerns by the United States as to their ownership of the Mississippi Territory (Alabama). All this would all change in 1800 with Napoleon Bonaparte’s raise to power in France. In Europe Napoleon had made advances into Spain, and controlled certain regions of that country. Spain had become weaken, not the power it once was. Napoleon again thought of a French presence in the new world, and in 1800 he began to take back New Orleans and the Louisiana Territory for France. For the next three years New Orleans was controlled by two European nations, Spain and France. Not being aware of the transfer of this territory from Spain to France the United States became concerned when Napoleon sent troops to New Orleans in 1801, which gave rise to fears of a French invasion of the U.S. Hearing of some sort of transfer between the two European nations President Thomas Jefferson sent his representative, Robert Livingston to France to get the details. He also authorized Livingston to make an offer to purchase New Orleans if the opportunity presented itself. Jefferson, covering all his bases, also had his personal friend Pierre Samuel du Pont, a French nobleman living in the States, to back-channel talks with Napoleon. Fearing a war with France over Louisiana Jefferson even considered an alliance with Britain, whom France was preparing to go to war with. This would be as a last resort for Jefferson, considering that relations between the States and its former mother country were not the best. Jefferson then sent James Monroe to Paris in 1802, to negotiate a settlement; if those talks failed Monroe was to then go the London. With the coming war with Britain, trouble in the transferring of control from Spain of the Louisiana territory and a slave revolt in Haiti, Napoleon had his hands full. Unbeknownst to Spain, or the United States, Napoleon dropped his vision of a French presence in the western hemisphere and gave orders to sell New Orleans and the entire Louisiana Territory to the United States, if they met his price. James Monroe came to Paris with permission to pay $11 Million for just the city of New Orleans and the land surrounding it. What France proposed was selling the entire 828,000 square miles, or 529,920,000 acres, of the Louisiana Territory for $15 million. Jefferson jumped at it, even though some in Congress complained that he didn’t have the Constitutional right to do so. Spain had asked that in the transfer back to France that they keep Louisiana, not selling or trading it to the United States. On November 30, 1803, Spain transferred Louisiana back to France. Three weeks later on December 30, 1803, France ceded New Orleans to the United States and on March 10, 1804, France transferred the remainder of the Louisiana Territory. The Louisiana Purchase would be one of the highpoints of Thomas Jefferson’s Presidency. With it the United States gained what would later become the States of Arkansas, Missouri, Iowa, Oklahoma, Kansas, Nebraska, parts of Minnesota west of the Mississippi River, most of North and South Dakota; portions of Montana, Wyoming, and Colorado. Also included by France in the purchase was what would be northeastern New Mexico and northern Texas. These last two lands would be a point of friction between the United States and Spain, and later Mexico. The Louisiana Purchase gave the United States one less European power to worry about. The concerns of an invasion by France during the negotiation, the continued bad relations with Britain, which controlled Canada, and having Spain in Florida and Texas had the young United States worried about its security. Spain saw that the purchase opened their eastern border to aggressive land hungry Americans. Texas and The Alamo: Conflict between Mexico and the United States (Part IV). Revolution gives rise to a new Nation. The American Revolution helps to open up the west. At the end of the French and Indian War, with the signing of a treaty in Paris on February 10th 1763, the British Empire now counted seventeen total colonies in the new world. Two were added by the war with Upper and Lower Canada and another two with East and West Florida. After the war France saw little value in the Louisiana territories that they retained after the war and ceded it to their war ally Spain. Spain even though lost its claim to Florida now had a buffer of land between Mexico and the English colonies. They also gained the city of New Orleans and navigation on the Mississippi River. Britain, although it looked as if they came out the overall winner in the war, made post war decisions that would be more far reaching and detrimental to their presence in North America. The first detrimental decision was made by King George III in his Royal Proclamation of 1763. In it he included provisions that reserved lands west of the Appalachian Mountains for the native population. This angered the thirteen original English colonies that had desires on expanding into these western lands. It was their expansion into those regions that helped to spark the war in the first place. Also with the French gone and the Spanish, for the most part, far away the thirteen colonies didn’t see the need for the protection of the British military. The last fatal decision by Britain was their plan to pay off their large war debt by imposing new taxes on those thirteen colonies. Their new colonies in Canada and Florida were excluded from these taxes. The British Parliament passed the Stamp Act in 1765 and the Tea Tax in 1773, these being the most infamous of the new taxes. Although each colony had a Colonial government, and the colonists felt that they were equal English citizens with their cousins across the ocean, they were never given a seat in the English Parliament. The new imposed taxes they felt was unjust because they had no representation in Parliament to plead their case. As the unrest grew in the thirteen colonies, especially in the Massachusetts Colony, Parliament and the King sent British troops to subdue the resistance. The actions by these troops further angered the colonists into open rebellion and finally revolution. On July 4th 1776 the thirteen colonies declared their independence from their mother country of Britain. As the war draw on King George III lost support in Parliament for the continuation of the fighting in America. On September 3, 1783 “the Treaty of Paris” was signed ending the American Revolution. By the early part of 1784 the Continental Congress had ratified that treaty and the United States of American was officially a born. The new thirteen Untied States were no longer restricted by King George’s proclamation halting their westward trek. The enterprises and population of those States had been growing at a tremendous rate since their founding and they needed land, and lots of it. The post war westward explosion was beginning, and Spain was watching. Texas and the Alamo: Conflict between Mexico and the United States (Part III).